Do you have a backyard shed you no longer use? Why don’t you transform it into an office space or a studio? 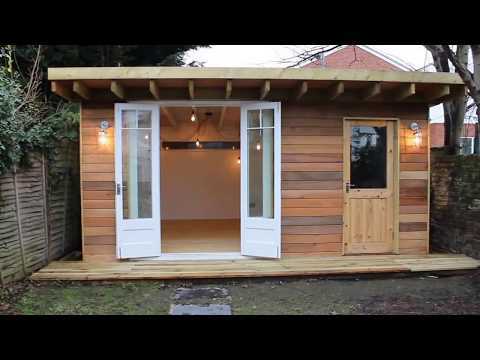 After all, sheds are a perfect place to retreat from the busy world and get in touch with your creative side. Whether you’re a writer or a painter, the ideas listed below can help when building your backyard studio. You need a space that fits the specific requirements of your work. Sculptors, for instance, require a larger workspace compared to someone who paints small portraits. So, before you clear out the interior of your shed, you have to determine how much space you need and plan accordingly. Sheds that haven’t been used for a long time probably have dirty and broken doors and windows. Replace the doors and windows for security purposes, as you’ll likely stay in this place for extended periods. Consider installing a rustic front door to achieve that warm and artistic vibe. Also, don’t forget to install insulated windows to keep your studio at a comfortable temperature all year long. Since they’re solely used for storage, most sheds only have electricity for one or two lighting fixtures. With assistance from a professional, upgrade the electrical wiring of your shed. Make sure that it’ll be enough for lighting, phone lines, Internet access, and basic power for your laptop or other small appliances. Feel free to decorate it in any way you want. Hang photographs on the wall, lay down a colorful rug, or set up unconventional bookshelves. Make the space more comfortable with decor that reflects your personality — this is your space, after all! READ How Far Should The Pool Be From The House? With these ideas, you’ll be better prepared to convert your shed into a backyard studio. However, even if you’re crafty enough to DIY this project, don’t hesitate to ask help from professionals. This way, you can make sure that you’ll get this transformation right the first time.